Skipton is one of the best preserved and most complete medieaval castles in England, despite enduring a three-year siege in the Civil War. After the Battle of Marston Moor it was the only Royalist stronghold left in the North. The Governer, Sir John Mallory, negotiated a surrender, and on 21st December 1645 the garrison marched out with colours flying and trumpets sounding. Cromwell ordered the removal of the Castle roof, but only ten years later the owner, Lady Anne Clifford, was allowed to replace them - on condition they were not strong enough to bear firing cannon. For centuries the little market town huddled for safety beneath the Castle walls, and successive Lords of Skipton were buried in the Parish Church - the most famous of them George Clifford, 3rd Earl of Cumberland, Champion to Queen Elizabeth I, one of her Admirals against the Armada. Come and explore this history-rich castle: still fully roofed, it repays a visit at any time of year. With your Tour Sheet in hand, step back into Skipton's colourful past! 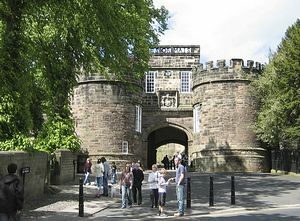 Skipton Castle is located at the top of Skipton High Street.